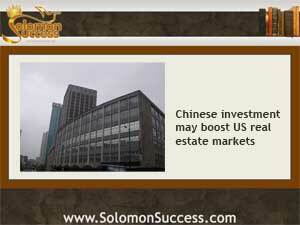 Solomon Success > Blog > Can Chinese Investment Boost US Housing? King Solomon was a vastly wealthy monarch who presided over one of the most prosperous kingdoms in the history of his people. But to build the crowning achievement of his reign, the great Temple, he welcomed foreign investment – in the form of capital and labor from the neighboring King Hiram of Tyre. Now, as the Bank of China becomes the leading foreign investor in the US, the housing industry is setting aside its suspicions and embracing the rush of Chinese investors in American property. That’s a very different picture from the situation a few years ago, when Japanese investors with big bucks began snapping up US real estate, including major landmarks like the Rockefeller Center, and raising fears that Asian investors would end up owning the country. What’s different this time around? A struggling housing market and a sluggish economy are ready for new money and new growth, and Chinese investors can provide both. A recent New York Times article pointed out that the Bank of China is now the largest foreign lender in US commercial real estate, and the Chinese government holds over $1 trillion in US Treasury Securities. Chinese investors are dropping big money into commercial real estate, with purchases including office complexes and commercial parks around the country. But they’re also funding new construction for commercial projects, and partnering with US investors and consortiums from other parts of the country to back a variety of development deals and purchases both large and small scale in markets around the country. Though much of the Chinese investment funding goes to commercial real estate, a sizable portion is also being directed toward home buying, particularly in higher end markets around the country, and in building new apartment complexes and condos in desirable areas as part of joint ventures with other foreign investment groups. Creswell, Julie. “Chinese Investors Pursue US Property Deals.” The New York Times. NYTimesOnline. 23 Jul 2013.